The new year brings renewed commitments, and hopefully one of your renewed commitments is dedicated time for family worship. I cannot stress the importance of gathering together as a family to read Scripture, sing, pray, and other profitable spiritual endeavors. Parents are sometimes at a loss as to what are the best resources to use to help with family worship; I regularly receive emails requesting recommendations of tools to use. Thus, I plan to write a series of posts recommending various resources including Bibles, catechisms, hymnals, devotionals, etc. In this first post, I offer suggestions of Bibles to use to read to children of various ages. First, let me outline the criteria I used to evaluate these Bibles. My desires and emphases might not be shared by everyone, but at least you’ll know what I looked for. First, I tried to select Bibles that focused on the authorial intent of biblical passages and tied them into God’s providential plan for history. In other words, I wanted to avoid two errors. On the one hand, I didn’t want a Bible that moralized Bible stories. On the other hand, I didn’t want a Bible that allegorized the stories. I wanted to choose Bibles that summarized biblical narratives in a way that highlighted their function and objective within their specific contexts and the greater story line of Scripture. Let me give you an example of what I mean by using the narrative of David and Goliath. On the one hand, I didn’t want a Bible that made the main point of the story courage or battling life’s challenges. That’s moralism. On the other hand, I didn’t want a Bible that made David an allegory of Christ and Goliath a picture of sin. As Christ-centered and profitable as that message is, I wanted my children to learn to interpret texts first in their original context and within God’s greater plan rather than well-meaning allegorization. Instead, I tried to find Bibles that would interpret the primary message of a story like David and Goliath as God’s power to keep his promises to his people and defeat his enemies using an weak vessel who he would later set up as the mediatorial king of his people and the head of the line of Messiah. Moral lessons are good, but they should be secondary. Likewise, I wanted the stories connected to the larger story, but without neglecting the original message or stretching allegories beyond authorial intent. Second, I tried to find summaries that weren’t silly, but rather reflected the original text as much as possible. This was partially because I didn’t want Scripture to be trivialized and partially because my ultimate goal was to transition to reading an actual translation of Scripture. This was very difficult to find for the youngest ages. As you’ll see below, I didn’t always accomplish this objective perfectly with every story in every Bible, but it was my goal. First, I didn’t want my children’s imaginations to be shaped by someone else’s representation. I wanted my children to imagine for themselves what people looked line and how events transpired. I also didn’t want the pictures to interpret the biblical events beyond what the text said. So whatever pictures there were in the Bibles, I wanted them to be as simple and few as possible. Second, I didn’t want pictures that trivialized Scripture, so I tried to avoid cartoon-like depictions in favor of more aesthetically-rich illustrations (although this was very hard to find). "... Right arm! Left Arm! ..."
My ultimate goal was to wean my children from pictures entirely as they got older. While I truly believe that even young children can grasp far more than we expect of them, I did take age into account when choosing Bibles. As my children grew, we moved from shorter, simple summaries of Bible stories, to longer passages from actual translations of biblical texts. We began regular family worship when our son was about 2 1/2 and our daughter was just an infant. Thus the first Bible I chose had the most pictures and the simplest stories. The Big Picture Story Bible is perfect for those ages and met most of my criteria. Here is a more thorough review of the Bible.) “Big picture” has two meanings: First, there are many big pictures, which our small children enjoyed. The illustrations bordered on cartoonish, but they didn’t cross the line in my opinion. Second, and the primary reason I chose the Bible, every story was deliberately tied into the “big picture” of Scripture. There is little moralism in this Bible. There is also little, if any, allegorization either. To use my previous example, the message of David and Goliath is God’s punishment of sin (“He let their enemies rule over them.”) and God’s faithfulness to his people (“God kept his promise to rescue his people!”). Perfect. The next Bible I chose was The Jesus Storybook Bible. This Bible has more text that the previous Bible, but it also has lots of detailed pictures. Again, the pictures border on silly in several places, but they were appropriate for my 2-4 year old children. Generally, this Bible centered on the primary themes of Scripture (punishment of sin, power of God, forgiveness from God, etc.) and tied the stories into the larger story of Scripture. As the title might suggest, the Bible is very Christ-centered, which is great. It usually steers clear of allegorization as well, choosing to highlight the narrative in context, and then pointing to Christ at the end of most stories, which I thought was mostly well-done. There are also moral applications made throughout, but they tend not to be the primary point of each story. Back to our example. Goliath is portrayed as a “scary enemy,” but he is presented ultimately as an enemy of God. The answer to this enemy was not simply a courageous boy, but that “God would do something. He would send someone to save them.” The conclusion to the story is threefold: First, “God had saved his people.” Second, “David was a hero.” And third, “Many years later, God would send his people another young Hero to fight for them. And to save them. but this Hero would fight the greatest battle the world has ever known.” Appropriate applications without moralism or allegory. This Bible also comes with an audio CD of David Suchet reading, which we’ve enjoyed in the car from time to time. As our children grew to around 3 and 5, I wanted a Bible with even more text and fewer pictures. The Gospel Story Bible was a good option. Each “story” in this Bible is a full page of text or more. The text often quotes from the English Standard Version of the Bile, which was a great transition for moving to reading actual translations of Scripture, and the Bible references from which the stories come are also listed at the top. Each story has just one somewhat abstract illustration, which I liked because it gave the children something to look at while I read, but slowly weaned them away from needing a picture. Finally, each story has a “Let’s Talk About It” list of questions, which were helpful for stimulating discussion from the story. When we read this story, we like to compare ourselves with David. But really, we are more like the men of Israel, afraid to fight and in desperate need of a champion to save them. David was God’s man for the job. He did what the Israelites could not do. The salvation David brought Israel should remind us of Jesus. Like David, Jesus was a king who went to battle on our behalf. His victory was over sin and death. Before David delivered the men of Israel from Goliath, they stood helpless against him just as we are helpless to save ourselves and need Jesus to deliver us from our sin. David’s life points to Jesus, and this story helps us see that we are not saved by our own strength, but by God’s power. Again, appropriate application, although I wish it wouldn’t have skipped over the original main message of the narrative as well. My children are now 4 and 6, and at these ages we were ready to move to a text only, actual translation of the biblical text. A great choice here is The Story. The Story is the actual, God-breathed words of the Bible. Each chapter was thoughtfully and carefully excerpted and then placed in chronological order. Transitions were written to smooth over places of omitted text (transitions appear in italic). 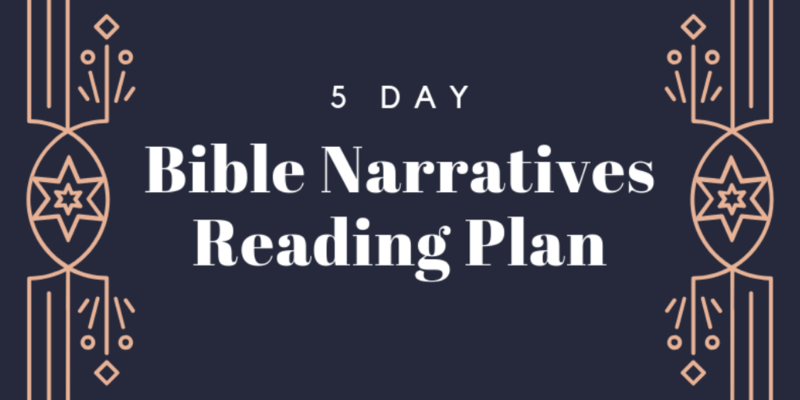 The texts were chosen to retain the overall flow of the narrative, so that when you read this story, you will get a sense of the “big picture” of the Bible. Line spaces were added when text was omitted, and a chart at the back of this book will let you know, according to book and chapter, what texts were included. I love that we’re actually reading the text of Scripture now in an accessible translation. There are no pictures, but our children have been prepared to use their own imaginations as they listen. I was actually pleasantly surprised that they didn’t complain a bit about there being no pictures; but I’ve been reading them other books without pictures as well (such as Hobbit and Lord of the Rings), so they’ve grown accustomed to it. I’ve found that I skip over most of the added transitions; they are often silly and casual, breaking from the normally reverent narrative of the biblical text. I wish the editors would have made these transitions more aesthetically pleasing and fitting with the rest of the text. But overall, this Bible has been a perfect step as we move toward reading the whole Bible through together as a family. The Bible also includes discussion questions at the end, which we’ve found helpful. We’re not finished with this Bible yet, but I plan next to choose a loose translation like the Living Bible or the Message and read from beginning to end. Or, I might decide that we are ready to jump right into the ESV. We’ll see! When our son turned 5, I decided it was time to get him his very own “real” Bible. He was just getting the hang of reading, and I wanted something that he could use as he began daily devotional reading and that would sustain him through the rest of his childhood. After hours of searching and research, I found the perfect Bible: ESV Seek and Find Bible. This Bible is great for several reasons. First, it is the entire text of the ESV. He’ll be able to use it for years. Second, it contains 120 narrative summaries accompanied by beautiful illustrations, sprinkled throughout the Bible in their appropriate places within the biblical text.. This was perfect for when my son was first reading since he could read those summaries himself. Third, it contains other helpful study aids, illustrations, Scripture memory, and questions that he can use as he studies Scripture himself. This new full-color children’s Bible combines the complete ESV Bible text with more than 120 new, vibrant illustrations of major Bible stories. 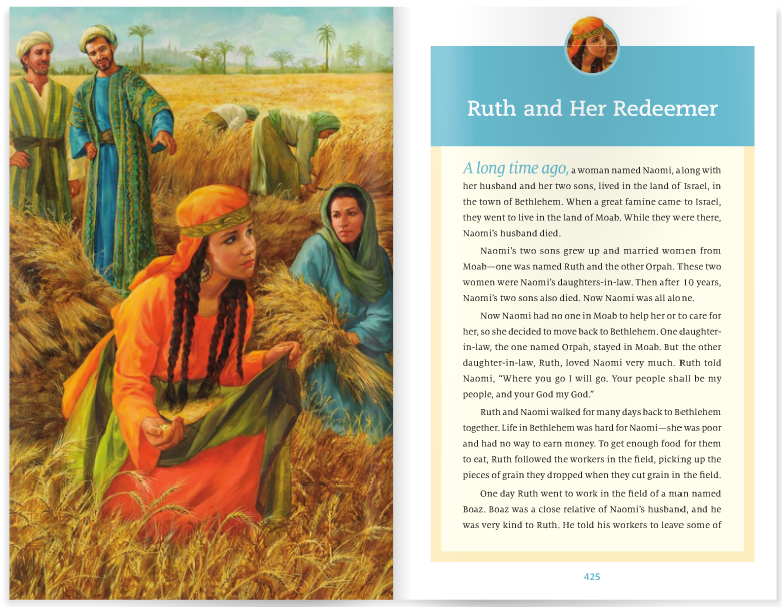 Accompanying each full-page illustration is the Bible story itself, clearly and accurately retold for young readers—and for the parents, grandparents, and teachers who read to them. 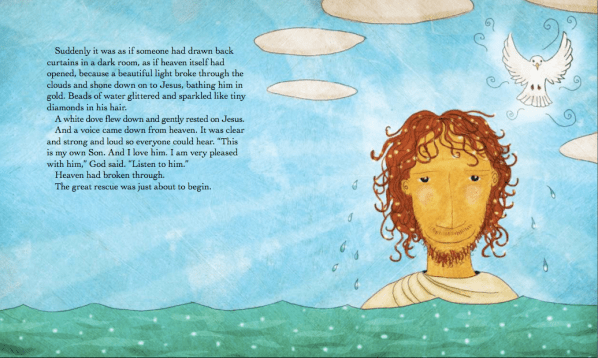 Each story includes a Key Bible Verse to memorize, Additional Readings for discovering more of the story throughout the Bible, and simple Reflection Questions to help children begin to understand and apply God’s Word. 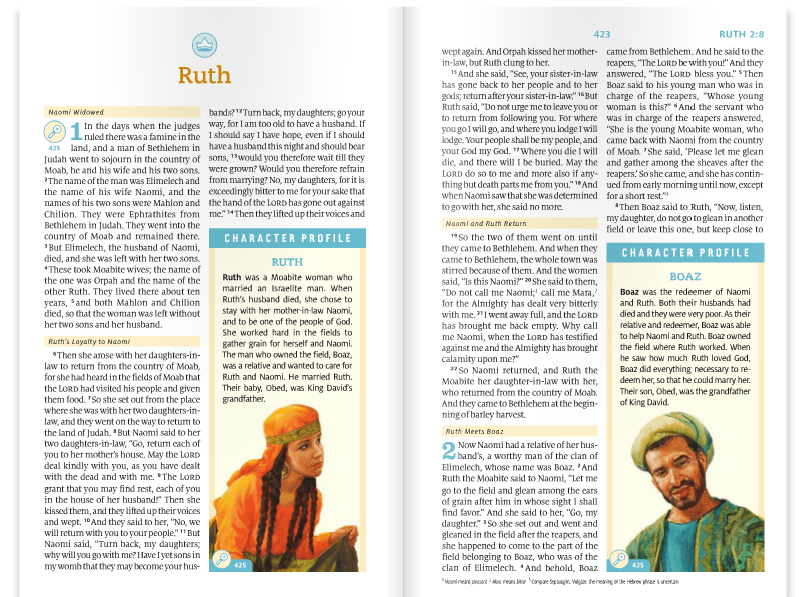 Colorful icons make it easy for young readers to see where each story is found in the Bible text and to locate the illustration that goes with it. In addition, dozens of Bible characters are profiled throughout the pages, and color call-out sections provide illustrated facts about important Bible objects, structures, and places. 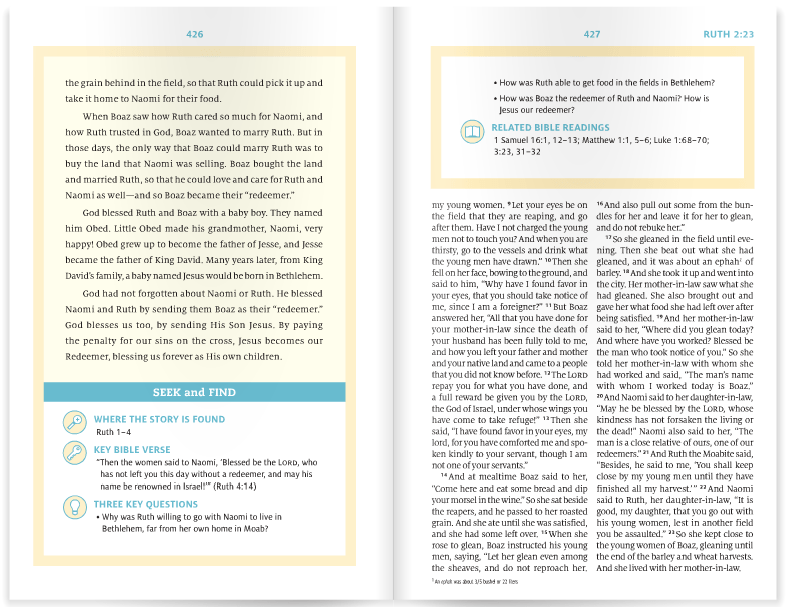 Each Bible book begins with a child-friendly introduction, highlighting the important characters and themes found in it. I also like that it doesn’t have a silly, “child-like” cover, again so that he can use this for many years. We made a big deal about this gift on my son’s fifth birthday, purchasing a carrying case as well, and he now reads from it himself most mornings along with using it in church services. I’ve also used some of the summaries in our family worship when we’re on vacation and can’t bring along too many books. When our daughter turns 5 in a few months, we plan to buy this for her as well (only in pink!). I hope you’ll find these suggestions helpful as you start your new year. If you have other recommendations, feel free to add them in the comments! Thanks for the recommendations of some great resources. I would like to add that Positive Action for Christ (positiveaction.org) has recently published “God’s Love: A Bible Storybook” in both hardback edition and iPad app. 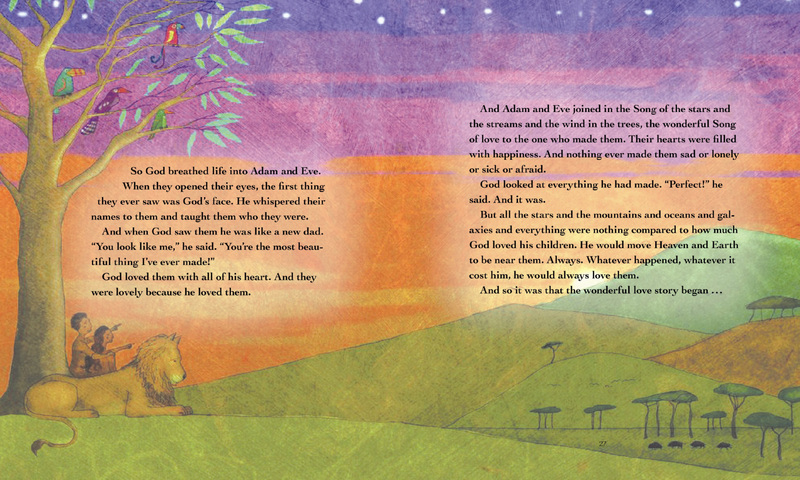 I have found it to be a great way to show my kids God’s love displayed through the stories of Scripture. It contains 120 illustrated stories that start at Creation and go through the death, resurrection and ascension of Christ. The iPad app provides interactive artwork and full voiceover for each story. Disclaimer, I am the president of Positive Action, but there are some unbiased review of the iPad app on iTunes. Any advice or links to the one you had recommended? Hi, Amy. Looks like you are correct that they are not publishing this any longer with the nice covers we got for our kids. Too bad. We haven’t really researched any other options since then, but I’ll post here if we find anything. Hi! I know this is an old article, but I need some advice on which Bible to pick for my kids. I am a very new Christian myself and feel so woefully inadequate to teach all of this to my children. One daughter is just turned 4, and the other just turned 1. We have the Jesus Storybook Bible, but I have just started reading it to my four year old. Do you think I should get the Big Picture one as well since this is all new to her? Even though she is four, would it help her to have a good picture book? And then later we could move to a more text based version? Keep in mind that she really has had no foundation in this at all before about six months ago. Also, do you know of any Bibles or books that might have lessons that we could study together so that she and I are learning together? As a side note, my husband is agnostic, so it’s up to me to teach our children about God as Jesus, and as a newbie myself, I’m a little worried that I won’t be teaching it well enough. Any help would be appreciated!